Michael W. Fox was born and educated in the UK, in his senior year in high school being elected a Fellow of the Royal Entomological Society (FRES) on the basis of his studies of Trichoptera and limnology, and was awarded the gold medal in elocution by the London School of Music and Dramatic Art (LAMDA). With a 5-year background of ‘seeing veterinary practice’ and farm work as a high school student he pursued his veterinary degree on a Derbyshire County Exhibition Scholarship at the Royal Veterinary College, London, from where he graduated in 1962, with honors in pathology and animal husbandry. He was awarded the gold medal and Fellowship of the Veterinary Medical Association by the Royal Veterinary College for his research report Diseases of the Sheep-dog in Relation to Management and Nutrition. His subsequent research into animal behavior and development in the U.S. at the Jackson Memorial Research Laboratory, Bar Harbor, ME, and the Thudichum Psychiatric Research Institute, Galesburg IL, resulted in a dissertation entitled Integrative Development of the Brain and Behavior in the Dog, (published in 1971 by the University of Chicago Press), that earned a Ph.D. in Medicine from London University in 1967. As Associate Professor of Psychology at Washington University, St Lois, MO, he continued behavioral and developmental studies in dogs, cats, wolves, coyotes, foxes and other related canids, for which he earned a D.Sc. in animal behavior/ethology from London University in 1976, he chose to focus on advocating animal protection, rights and environmental conservation, and in continuing his avocation as a teacher and public speaker. He was a founding board member of the Wild Canid Survival and Research Center in St Louis. Also worked as a pro bono veterinarian at the St. Louis Humane Society. Between 1976 and 2002 he served in various positions with the Humane Society of the United States, including Scientific Director and Vice President for Bioethics and Sustainable Agriculture. During this time he was a regular guest on Johnny Carson’s Tonight Show, and published two best selling books, ‘Understanding Your Dog’, and ‘Understanding Your Cat.’ He was chairman of the National Academy of Science (NAS) Committee on Applied Animal Ethology, and served on the NAS Committee on Laboratory Animal Care and Standards for Dogs and Cats. He was also a member of the Council for Agriculture, Science and Technology Task Force on Farm Animal Welfare, founding member of the Scientists Center for Animal Welfare, and was an advisor to the National Organics Standards Board on farm animal health, welfare, and humane, sustainable agriculture. 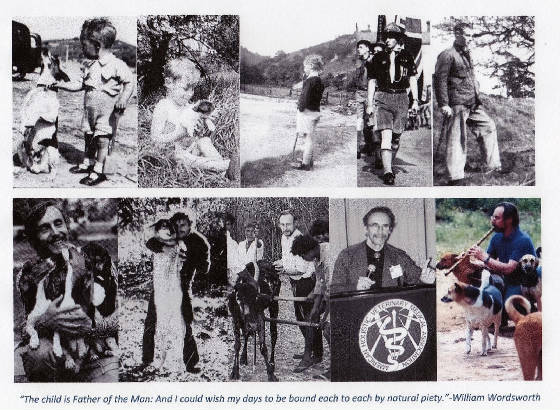 His overall mission was to “heal the human-non-human animal bond” through advances in animal welfare science and bioethics. He is a recipient of several awards including: Royal Society for the Prevention of Cruelty to Animals, 1959 ‘For his courage and humanity in rescuing a heifer from a disused mineshaft. Washington University, St. Louis, Alumnus Faculty Award, 1972 Distinguished Teacher. Dog Writers’ Association of America, 1973 Maxwell Award. Christopher Award for Children’s literature, 1974. International Felix Wankel Prize, 1982 For Research in Animal Welfare. The Delta Society, 1986 ,‘For exceptionally significant contributions to our understanding of the relationships between people and animals’. Psychologists for the Ethical Treatment of Animals, 1987 ‘For exceptional contribution to the advancement of animal welfare, science and philosophy. He is a member of the British Veterinary Association, the American Holistic Veterinary Medical Association, Founding Member of the International Society for Applied Animal Ethology, and an Honor Roll member of the American Veterinary Medical Association. For more details visit his website www.drfoxvet.net His e-mail address is ipan@erols.com For interviews concerning his participation in the historical advancement of animal welfare science, bioethics and animal rights, see interviews on this latter website. He has collaborated with his wife Deanna Krantz in projects in Europe, from Germany to Assisi, Italy, and in Arusha, Tanzania and India. Details of her work involving Asian elephants and the care of Loki, an injured captive wild elephant, and the inhumane treatment of India’s ‘sacred’ cow are posted on the website www.drfoxvet.net. He has Power Point presentations and DVDs to offer on a variety of topics including Eating With Conscience; Animals, Nature and Religion; Evolution or Extinction: Human Choices for a Viable & Humane Future, as well as holistic care for companion animals, cat and dog behavior and development, animal emotions and awareness, wolf behavior, communication and the fate of the Gray Wolf, and the hazards of genetically engineered foods.